Do you want to experience the flight of running? Do you want to learn to work with gravity dynamically? Do you want to run faster, prevent injuries, and feel the euphoria of balance-in-motion? This workshop will improve your running skills and deepen your understanding of dynamic motion. You will master running drills, mental imagery, and condition your body to work with - not against - gravity as you run. More importantly, you will experience the pure joy and delight of flight! We welcome all levels of running experience. You'll Learn About Movement. How do your arms and legs work together? How should you be swinging your arms? How do you direct your arm swing to improve leg stride? What can you control and what can’t you control while running? What mental images are you using to guide your body? You'll Prevent Aches & Pains: How can you effectively transfer kinetic energy without hurting your joints? What is an effective warm-up and cool-down sequence? What drills will help prevent joint misalignment while running? You'll Improve Performance: How can you save kinetic energy by efficiently transferring weight in each step? How can you run faster? How can you improve your breathing and oxygen intake? You'll Improve Your Living Wellness: How can you positively influence your internal health and emotional landscape? How can you feed your spirit? How can you nourish, rather than hurt yourself, with running? 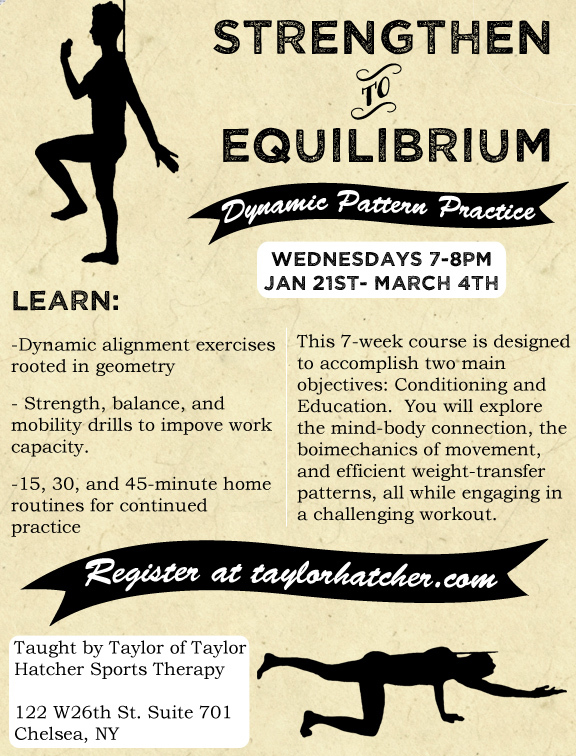 These courses are designed to teach you about dynamic alignment and how to move better. The courses heal and prevent pain syndromes, muscular imbalances, and repetitive motion injuries. Class size is capped at 8 people to ensure quality instruction and small group support. We will be announcing upcoming courses soon! What do you mean when you say dynamic alignment? Our bodies are shaped by how we move. Every movement (or non-movement) informs our cellular structure, communication, and function, which greatly influences our overall sense of wellness. Exercise science has taught us that our bodies rebuild themselves along the lines of stress, informing us that how we move and stress our bodies matters. As your body regenerates the next "you", our dynamic alignment courses intervene and direct cellular information toward a balanced body. Our classes are designed to advance the collective knowledge on how to move with balance and harmony while experiencing dynamic motions, such as running, walking or hiking. The second highest U.S. medical expense, joint replacements, are a often from misalignment and can be easily prevented by learning how to move. Most pain syndromes and injuries are rooted in imbalanced tension relationships throughout the limbs, head, and spine. Using insights from sacred geometry, physics, bodywork and exercise science, our courses teach how to transfer body weight efficiently to heal/prevent muscular imbalances and prevent joint wear and tear. The benefit of an alignment practice goes beyond the physical. The more we align our physical bodies, the more we improve our internal functioning and prevent chronic disease. Improving our circulation and how it flows brings clarity to our minds and enhances our lives. We feel empowered, strong, robust, and we are able to engage fully in life when we are aligned. We can live fully and arrive to each day with our greatest potential when our minds, hearts, and guts are aligned and coordinated in time. Who are these courses designed for? 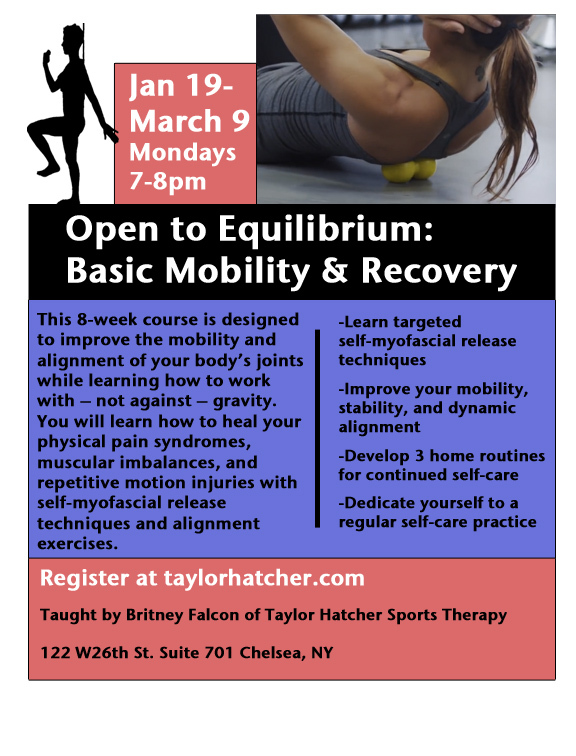 These courses are designed for anyone who is interested in learning about how the body moves as a whole system. Most movement or exercise classes are a summation of the parts – i.e. your left leg + spine– but we view it from a whole system perspective and have found that the possibilities are endless. Our method allows you to learn about your whole system and apply the concepts and guidelines in a variety of ways - running, hiking, cycling, walking, dancing, basketball, and so on. Our outdoor Running Skills 4 Wellness courses are held at Prospect Park and Central Park. Our indoor Dynamic Alignment classes are held at CATA, the Center for the Advancement of the Therapeutic Arts. This organization is located on the same floor as our offices (we are #703): 122 w 26th street, room 701, in the large classroom. So glad you asked! registration is not currently live, but you can email us at info@taylorhatcher.com. I still have questions. Who do I ask?